Founded in 1960, Berkeley Preparatory School is a private school consisting of 1,250 students, from Pre-K through 12th grade. 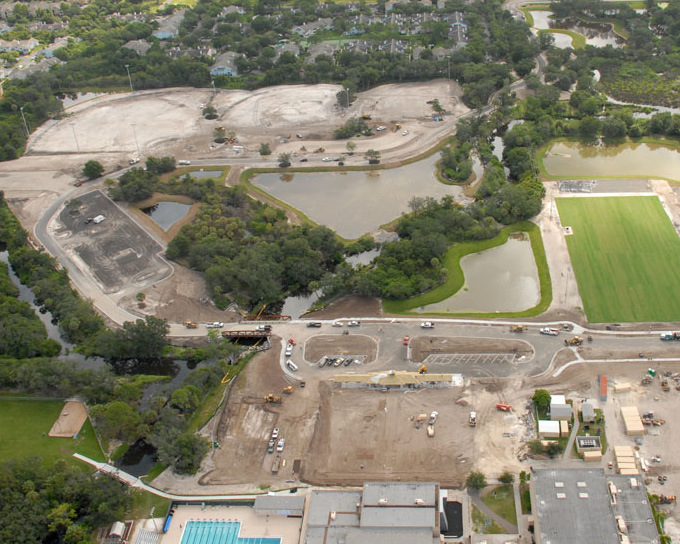 It is located on 80 acres in a Tampa suburb with 80% of its students participating in an athletics program. In order for Berkeley to become the world-class school it aspires to be, it was determined that a $50 million capital campaign project should be initiated. Multiple phases of the project include: the addition of a 53,000 square foot sports complex, a quad with clock tower, an early childhood center, a 75,000 square foot arts and sciences building, a chapel, a baseball stadium and a softball stadium. The first phase of this expansion project included the addition of 3,000 feet of roadways and required both pedestrian and vehicular bridge crossings over the Sweetwater Creek system. Construction of a new entrance off Bray Road utilized a 35-ft. x 70-ft. vehicular truss structure and provided vehicle access. 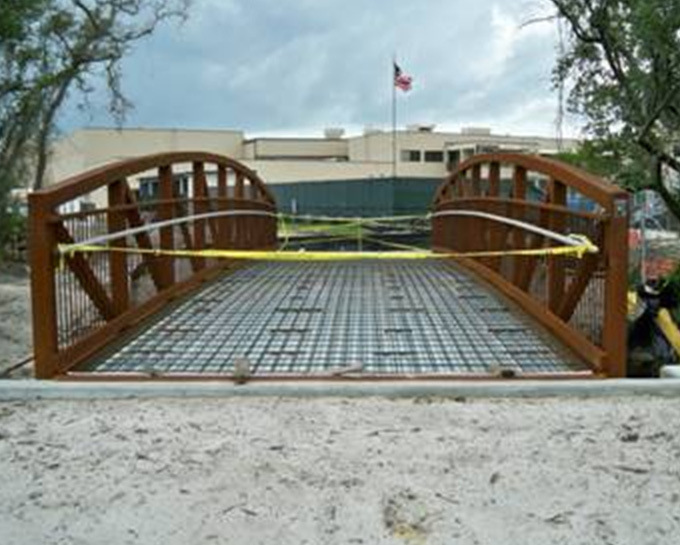 Pedestrians gained access to a playground from the main campus thanks to the installation of a 12-ft. x 51-ft. Continental® Capstone®-style truss over a tributary of Sweetwater Creek. 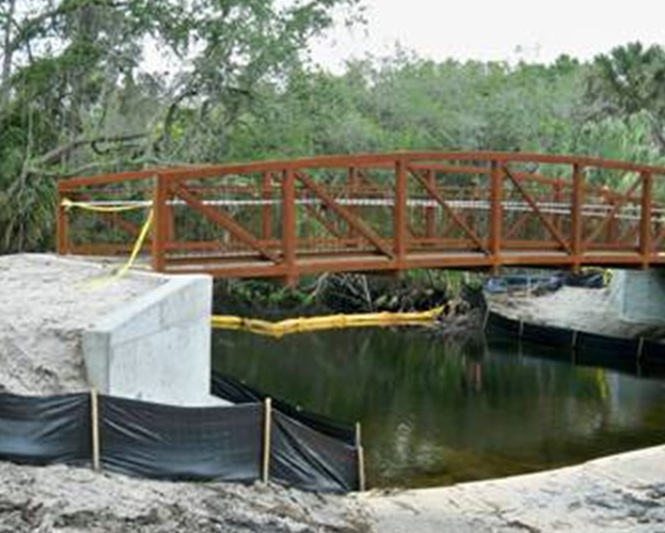 The bridges spanned the creek and resulted in minimal disruption of the side slopes. The bridges were installed during the dry season to further ensure there were no water quality issues during construction. The vehicular structure was installed in about 3-5 days while the pedestrian structure took only a half day. In addition to the truss structures, the project also called for approximately 6,000 feet of A-2000™ PVC pipe to be used for drainage purposes. A-2000’s superior strength, joint tightness and overall quality have made it a standard in the industry. In this instance, it was chosen for its speed of installation, easy handling and reliability. The school and the civil engineer, Fuxan Engineering, evaluated several alternatives including conventional concrete bridge and box culverts. The Contech steel bridges were chosen after considering the ease of construction, costs and hydraulics. The first of three phases of the Berkeley Preparatory School Expansion project is expected to be completed by Summer 2012.